Successfully Added Car DVD Player - "Road Cylon" - Android OS, GPS, 2DIN, DVB-T, 3G+WiFi (Volkswagen Fit) to your Shopping Cart. 2DIN Car DVD Player for Volkswagen featuring Android OS, 3G, Wi-Fi, GPS, DVB-T, and more to make your car ride incredibly convenient and entertaining at the same time. With 3G, WiFi, GPS, DVB-T and a compact design, the “Road Cylon” Android Car DVD Player is the best choice for both the kids and you to enjoy a fun road trip. Adding Android to a Car DVD opens up a whole world of possibilities. On top of the regular multimedia capabilities of a Car DVD Player, you can now download your own favorite apps, play the latest Android games that everybody is playing, and surf the internet using high speed 3G or Wi-Fi. The “Road Cylon” meets every need of the kids, the adults, the driver, and the passengers. Finally a car DVD that transforms each drive into an entertaining experience for everyone in the car! The "Road Cylon" is guaranteed to be the biggest hit in your retail store with its dazzling array of new features and the awesome Android 2.3 operating system. It’s now in stock for both single and bulk purchase. Order yours today and we will ship out within a day! 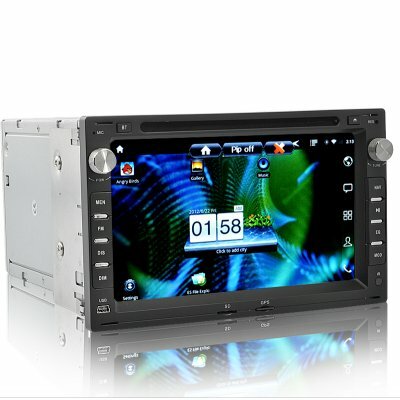 From your source for wholesale Android Car DVD Players, Chinavasion. This Car DVD is compatible with VW 1999-2005/PASSAT/POLO/JETTA/GOLF4/TIGUAN/EOS TSI/SEAT LEON/Rabbit/Bora,SKODA (1999-2005), and Peugeot 307 (1999-2005).